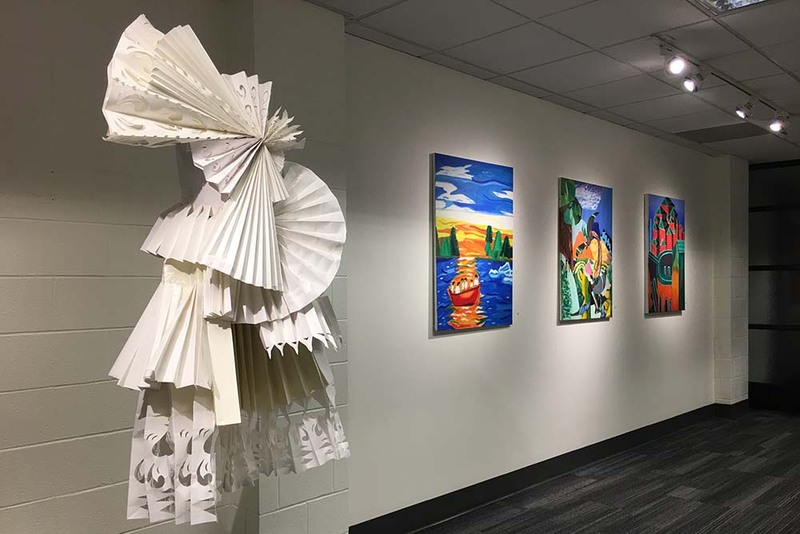 The Student Works Gallery at Rutgers University – Camden is an art gallery showcasing diverse contemporary exhibitions of current students. Our goal is to provide a space where students can gain experience exhibiting their work in a professional setting. We also feature occasional curated shows of alumni, faculty, and invited guest artists. The gallery is located in the Campus Center off Third Street (near the Corner Store). New Visions 2.0 is our second-ever annual High School Juried Art Show. High School Students all over New Jersey were invited to participate for this week-long exhibition which culminated with Arts Day, the Fine Art Department’s open house. The Student Works Gallery kicked off the New Year by reflecting on all of students’ accomplishments in the Fine Arts Department! Mixed media, sculpture, paintings, and much more was featured in this exhibition from Art of Critique. Art of Critique transforms the Student Works Gallery into a rolling exhibition for class critiques. Professors bring their classes to the gallery and each day there is a new variety of student artworks from the past year! This year Painting I, Digital Photography I & II, Visual Fundamentals, Advance Sculpture, Digital Media, and Sculpture Foundations all joined us this year to participate. A collection of student works courtesy of student Jacob Lechner, and Professors Bruce Garrity and Ken Hohing. This year Student Works hosted RU Scared with the Arts Students League. Alternative Nature focuses on the photographic artwork of photography professor Ken Hohing. His current work represents a continuing desire to investigate many societal taboos associated with our ever-increasing disconnect with nature. 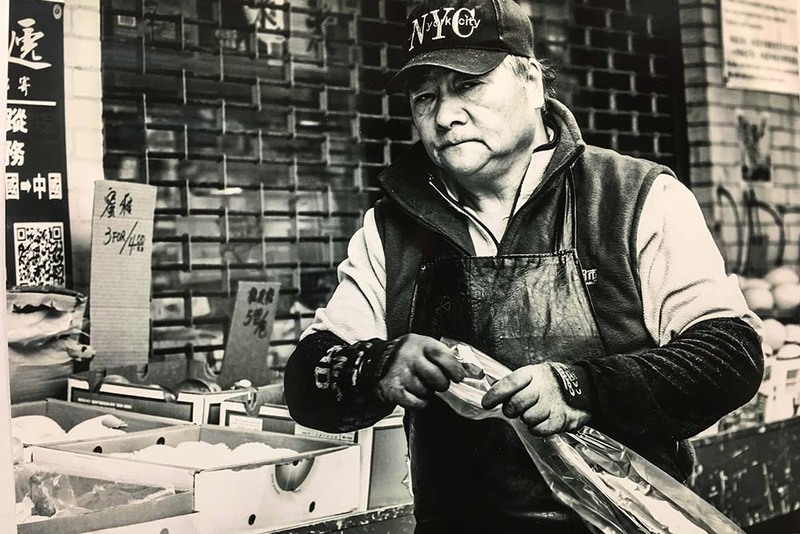 Hohing, a faculty member in the Department of Fine Arts, also uses his work to emphasize “the struggle for survival and the cycle of life and death that persists without compassion or misplaced sentimentalism.” Hohing studied photography and photo design at the Johann Wolfgang Geothe University in Frankfurt and the Gasamthochschule in Kassel, Germany. 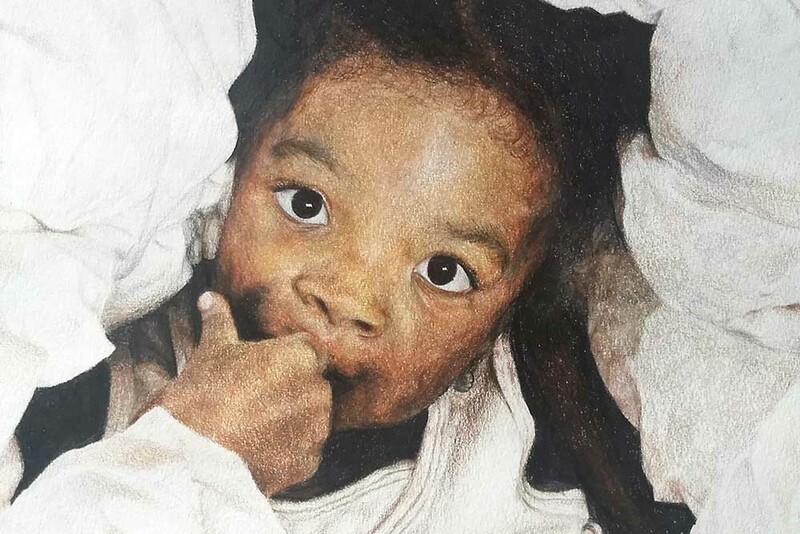 His work will be on display in the Student Works Gallery (in the campus center) until October 4th, with a reception on Thursday, September 27th at 4:30pm. NERVE: Artists who have the Nerve to be Women is a collection of student, alumni, and community artists whose work reclaims the female form from centuries of objectification in male art. This show creates a dialogue about various women’s identity, expression, and experience. Nerve is curated by Tiana McMillan, who is a Student Intern at the Student Works Gallery and a senior Fine Arts student graduating this May. The show will open this Thursday the 29th from 5:30-7:30pm and will be on view until April 16th. What does the artwork from professors of Biology, Mathematics, English, and Childhood Studies look like? 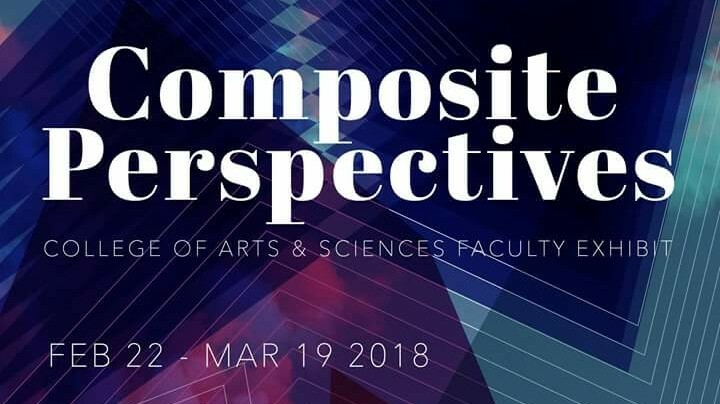 Discover the talent of Rutgers University-Camden’s College of Arts and Sciences Faculty in the exhibition Composite Perspectives. The opening reception on Thursday, February 22nd from 4:00-6:00pm is open to the public. Food and refreshments will be provided. COMMUNITY featured artwork produced by community college students. Closing Reception was held on February 17th. NEW VISION featured artwork produced by high school students. Closing Reception was held on February 10th. For the second year, we hosted Fall Semester final critiques in our gallery. Five classes had the opportunity to hang their finals in our gallery for a salon-style critique session. The work was exhibited in a show throughout the winter break. Millennials have been moving to cities in far greater numbers than previous generations, but what exactly does our generation see in these urban landscapes? We received images of the everyday and the extraordinary; ruins and grandeur, dystopia and paradise; new and old, fact and fiction. While these mixed viewpoints don’t necessarily represent those of the artists, they do reveal to us truths about our modern urban environments. This exhibition is a student response to the urban landscapes presented in the Stedman Gallery’s exhibit, Picturing Camden. In conjunction with the “Cuba Conference 2017” between Rutgers-Camden and the University of Havana, we held a solo exhibition for a Cuban artist. This show allowed the Department of Fine Arts to welcome many leaders from our University and our city into the gallery for the first time. Highlights included our Professor’s choice of artwork done in the classroom. Selected by the Heads of each concentration, our gallery featured Animation, Drawing, Graphic Design, Painting, Photography, and Sculpture. “Highlights” was a major stop during “Arts Day” an open house for potential new and transfer students. The exhibition demonstrated the diversity of our program. After the closing reception for our Summer show Art in the Landscape, we held reveal exhibition for a student mural. The 12 foot by 8 foot mural for Health Services was painted on parachute fabric with a variety of methods. The mural was completed by students Emily Ramos and Logan Fleig under the direction of Alumni Jacob Foster and Professor Margery Amdur. The gallery gave us an accessible space to exhibit the contemporary mural before it was installed. Additionally, we explained the process of making the mural in our didactic text and exhibited process pieces, stencils, and photos of the mural’s progress. “Art in the Landscape” consists of 10 artist’s unique approach to landscape art, made during an annual summer residency. The summer landscape trip is one of the oldest traditions of the Fine Arts Department. Initially a trip for painters, it has evolved to also include drawing, photography, mixed media, sculpture, and site-specific installations. Our last show this semester features the work of Ken Hohing’s Experimental Photography course. Students experimented with projection, printing processes, photo transfers, and alternative surfaces. Museum Studies collaborated with the Student Works Gallery for our first non-art exhibit. Nine students of Dr. Pilliod’s students from Intro to Museum Studies had the opportunity to create their own museum concept and display the information in a gallery setting. Museum concepts spanned various interests including art, religion, local history, children’s literature, science, fashion, and even beer! Laura Pennestri’s photography series on tailgating marked the first time an artist had a solo-show in the Student Works Gallery. With our new renovations, we were also able to have two shows going on in our gallery at the same time. The series featured a dozen photographs that analyzed the tradition along with texts explaining its history. 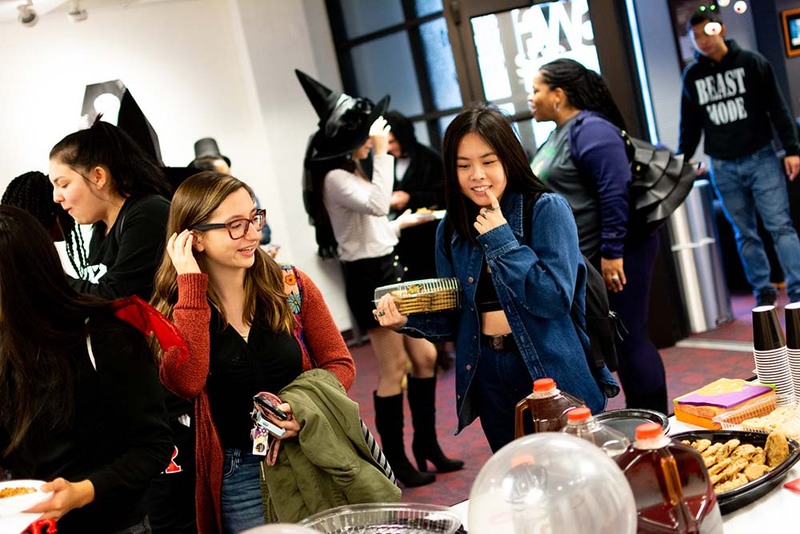 Our Assistant Director, Tiana McMillan with the help of animation major Melissa Perez curated an exhibit that coincided with Camden Comic-Con . It was perhaps the most diverse exhibit that the Student Works Gallery ever featured. It included digital art, character design, photography, sculpture, and traditional art. And during Camden Comic-Con on April 8th, we featured a selection of animations. The exhibit also included an origami butterfly installation by our door and window. “Selfie/Self-Portrait” was the most ambitious exhibit that we had planned yet. The volume of work we received allowed us to curate a high-quality exhibit and control its collective direction and mood. We exhibited 12 artists and had a self-curated wall of selfies that grew as the exhibit progressed. In response to a need for final critique space, we decided to host the Fall Semester final critiques in our gallery. Five classes had the opportunity to hang their finals in our gallery for a salon-style critique session. Afterwards, selected work will be exhibited in a show throughout the winter break. Ken Elliott kindly connected us with Leah Falk, the director of the new Writers House. We were thrilled to organize their first art reception with photographers from Ken Hohing’s Digital Photo II. The photographs were picture prompts that invited interdisciplinary inspiration from our two departments. Our first exhibit showcased assignments from 3 different courses (Sculpture Foundations, Painting II, and Visual Fundamentals). Each assignment dealt with the challenge of combining various materials, styles, or sources to construct one cohesive piece. Page last updated by Department of Fine Arts at 10:06 am February 14, 2019 . This page was printed from http://finearts.camden.rutgers.edu/student-works-gallery/ at 2:01 PM Friday, April 26, 2019.